Our wedding was one of the happiest days of our lives. We've created this photo album to commemorate the occasion and help us remember the good times. Whether or not you were able to share the day with us, we hope this album conveys some of the joy we felt. On this home page, we'll include some of the photos taken during the wedding. 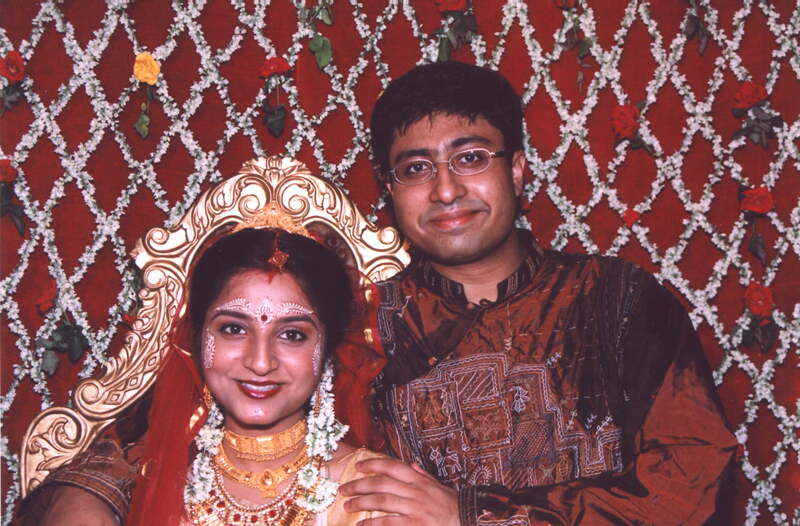 Our wedding was according to the Bengali custom. The tying of the nuptial knot in traditional Bengali style entails a series of elaborate and colorful ceremony of rituals, which are not only enjoyable but are of great significance in conjugal life. The blowing of the conch shell and ululation by the women gathered at the wedding venue are most characteristic of a Bengali marriage. Shehnai recital played by live musicians or else played over a music system adds to this symphony. The purpose is to draw the attention of all and sndry to the wedding and also to summon the invitees. It is also a kind of social declaration from the family to the rest of the society. Don't forget to sign our guestbook below after you've taken a look through our album!